A year ago I visited Huanglong (黄龙 huáng lóng) National Park in Sichuan for the first time. It was an amazing experience and although I got busy and didn’t write about it back then, I’ve been meaning to ever since. In June 2012, my friend Esther visited me in Beijing. When we were planning her trip, she said the one place she really wanted to go was Jiuzhaigou in Sichuan province. She’d seen the photos from my trip there with my parents in 2009 and ever since she’d wanted to go. 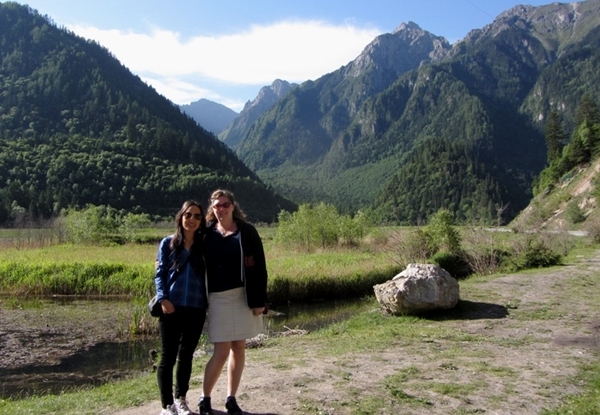 (I already wrote about our June 2012 visit to Jiuzhaigou). I didn’t know much about Huanglong, but I thought it would be fun to do something new to both of us, so we added it to our itinerary. We left Jiuzhaigou very early in the morning, with a driver I’d hired to take us to Huanglong Park. We stopped at a lake just before entering the switchbacking climb over the mountains and back onto the plateau. We weren’t fussed about stopping but the driver was very keen on it, convincing us we’d like to. I figured it wasn’t worth arguing so we got out, stretched our legs, took some photos, and chatted with ladies selling jewellery. My theory is the driver just really wanted a smoke break. Behind us are the start of the mountains we are about to drive up through. As we climbed I watched the clouds with fascination, the fog-like covering over hills to the side. We saw the vapours moving wildly while the cloud shape itself stayed precisely where it was. 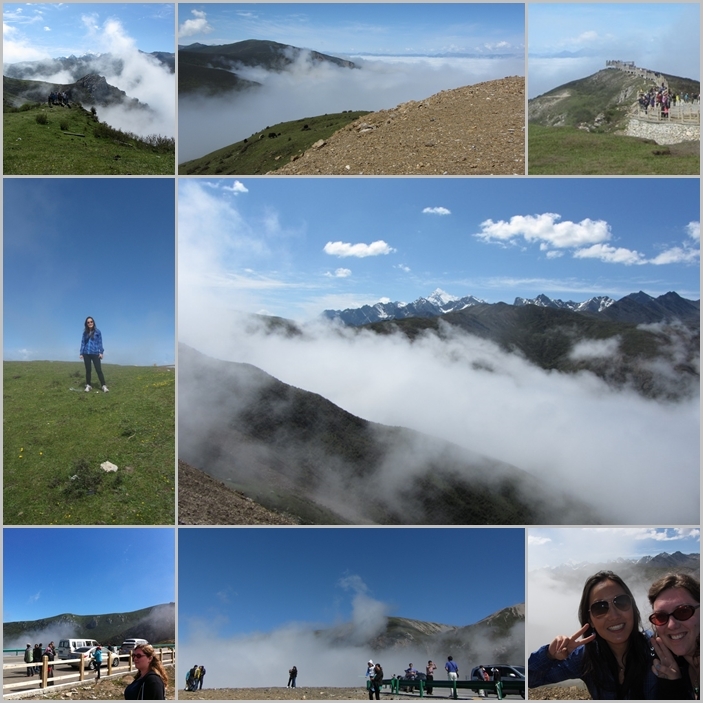 Then we climbed onto the plateau and into the fog. It went from clear and bright to damp and grey in moments. We stopped in Songpan (松潘 sōng pān) for petrol and then began climbing the pass over the mountains toward Huanglong. It was cold and damp, the fog so thick we could barely see beyond our car. Songpan – complete with cloud over terraced hills in the background and local transport in the foreground. The fog thinned a little and I could see we were travelling narrow roads winding around cliff edges. Suddenly we were out in the sunshine – and I realised we’d passed through the top of the cloud cover filling the valley below! The skies above were a stunningly deep blue – no doubt in part due to the very high elevation. We stopped at several look outs leading up to the peak of the pass. We looked down on a sea of cloud over the plateau below – strange to realise that Songpan was under there somewhere. We looked across the smaller cloud-filled valley to steep mountain points on the other side. We saw yaks grazing along the steep slopes leading down from the lookouts, wisps of cloud washing around them. As the cloud rolled around us we went from totally enclosed to washed in bright sunshine and back again. There were plenty of tourists (mostly Chinese) at these look outs, and we mostly kept away from the most crowded points. The last lookout was at the highest point of the pass – 4,000m above sea level (more than 13,000 feet). The pass is above the tree line – there were only the sparse grass and rocks of alpine meadow around us, as at most of the lookout spots. 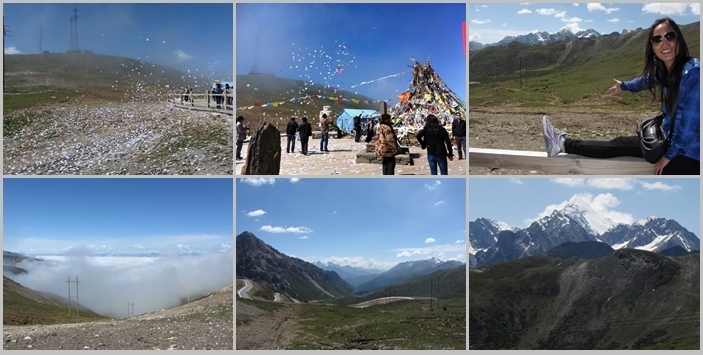 Near the last lookout was a Tibetan buddhist monument was covered with strings of prayer flags (long da / lung ta), and many tourists buy individual paper flags to throw into the wind – the hillside was covered with them. Above was our clearest view yet of the Min Shan (岷山 mín shān) mountain range, where China’s easternmost glacier is located. There is snow year round, and in early summer we could see plenty of it up there. Sharp above the rest rose Xuebaoding (雪宝顶 xuě bǎo dǐng) which peaks at 5,600m (18,000 feet) above sea level. Looking ahead we could also see the severe switchbacks of the road leading down into the valley below. As we drove down into it, we saw groups of mountain goats along the roadside, plus wildflowers of various kinds. We soon arrived at our hotel, stopping briefly to check into our rooms and eat an early lunch. The hotel was only a few hundred metres from the walking entrance to the park but we took a park bus further down the valley because we’d decided to take the cable cars up and walk down. 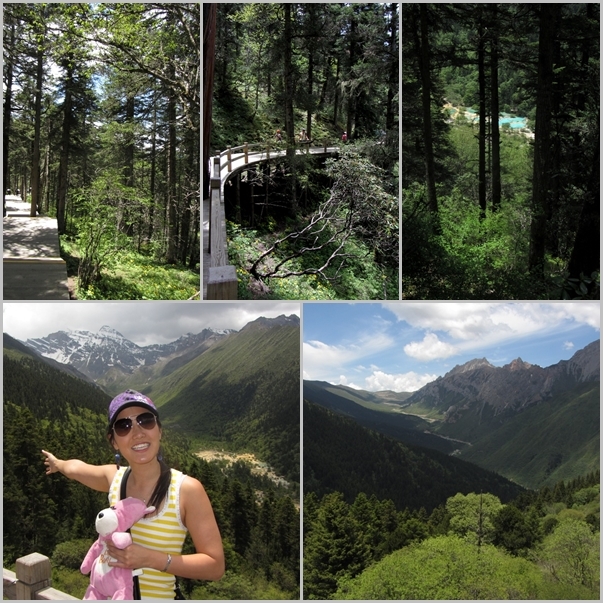 (We did about 5km of walking that day, far less than in Jiuzhaigou the day before, but at a much higher altitude). 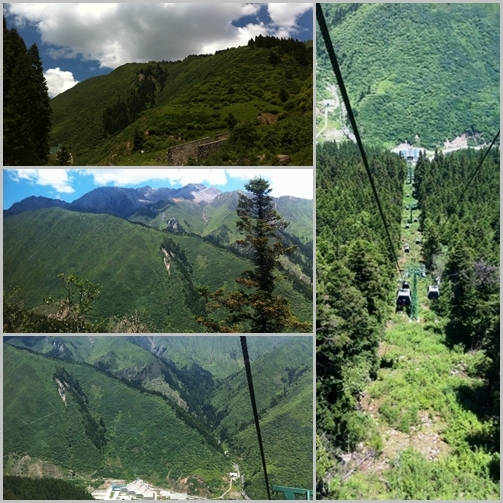 In the cable car we were amazed at our near vertical ascent, the massive pines around us, and the view of beautifully green mountain faces across the valley. We walked along well kept wooden pathways through the forest around to the main valley of Huanglong park. The forest around us was breathtaking – full of ancient trees, including large, gnarled rhodedendrons; the light, when it penetrated, was extremely bright, and highlighted incredibly brilliant greens and tiny wildflowers in the undergrowth. As we walked, we both felt the effects of the altitude – mostly we felt breathless whenever we had to go up or down a few stairs in the path. I had to be careful to breathe deeply and regularly or I started to feel lightheaded. Overall the altitude wasn’t a big problem, we just kept to a reasonable pace and drank lots of water. Soon we came to a lookout, from which the whole Huanglong valley spread out before us – the Min Shan peaks above us in the south (to our left), and in the north (to our right) the mountain pass and winding road we’d travelled earlier. From there we continued on the wooden walkways through the forest, hugging the side of the hill, toward the top of the valley. Every now and then we caught glimpses of the brilliantly coloured travertine pools in the valley below. We were thankful for the trees above filtering the bright sunshine that beat down. Soon enough we reached the travertine valley and entered a whole new world of wonders – which I’ll write about in my next post!